Watching the coverage of typhoon Haiyan and its aftermath has been an incredibly emotional experience for me. 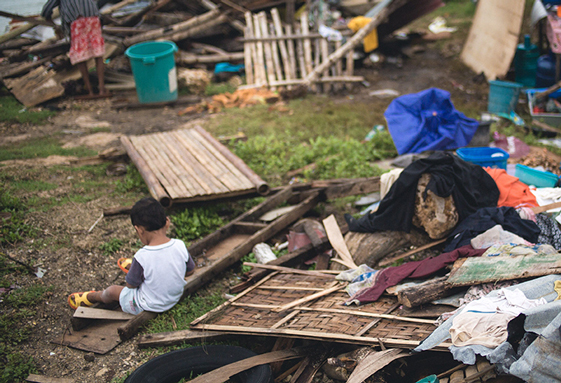 Our families in the Philippines live outside of the areas hit by Haiyan, so in that respect, we’ve been spared the terror and helplessness so many people are going through right now. Underneath it all, though, is incredible sadness nonetheless. Sadness at seeing so much devastation and suffering on the faces of so many people who look just like your siblings, cousins, aunts, uncles…you. Sadness at the complete breakdown of life and peace and order. Sadness at the difficult circumstances that continue to thwart the arrival of basic supplies of food and water and medical aid. I’ve never been to Tacloban, the city hardest hit by Haiyan, or much of Visayas, really, because my parents are from further north: my dad from Ilocos Norte, all the way north, and my mom, from Quezon, a couple hours south of Manila. But my parents met and went to school in Dumaguete, which is close to the island of Cebu, the island just west of the island of Leyte, which is the island that Tacloban is on. I was born there. I don’t remember much from the time, but when I look at pictures of me as a child, I see a peaceful seaside town, full of life and people. My father commented that he can’t remember a time when the Philippines made the front page of The New York Times or had constant prime time coverage on the major news networks in the West. Maybe back during the Marcos years, or when Ninoy Aquino was assassinated on the tarmac. I’m so grateful that this disaster is getting the needed attention it deserves because so many people need to have their appeals heard. But there’s a little wistfulness, too, that this kind of coverage only happens at our lowest points. I want people to know that who we are as a nation is more than the corrupt governments we’ve endured and the abject poverty we have yet to climb out of. Who we are as a people is more than the pile of rubble and desperate looting you see on your tv screen. There is no excuse for theft or violence in the name of looting, but I don’t know what I would do if I were in the middle of a disaster zone that looks post-apocalyptal, with no food, no water, and no idea of where the rest of my family went, what is left of everything I knew before the storm, and if anything will ever be the same. If you are able to help in any way, please do. If you are unable to give monetarily, please give your support and prayers to those you know who are suffering from afar, separated from the country and family they’ve left behind. If you are able to give monetarily, I’ve included some links below.